The Client extension API for the Requirements Management (RM) application now supports access to the URIs associated with selected artifacts and the current configuration. This support enables extension developers to use the URIs to interact with external services by using the information gathered from the extension. The URI of an artifact can be accessed from an ArtifactRef object via the ArtifactRef.toUri() function. For details, see RM.ArtifactRef. Information about the current configuration context is available from the RM.Client object via the RM.Client.getCurrentConfigurationContext() function. For details, see RM.ConfigurationContext and RM.Client.getCurrentConfigurationContext. You can now electronically sign a baseline by opening the baseline and clicking Sign. Depending on how the project administrator has configured the project area, after you re-enter your user name and password, you might need to select a reason for signing and enter a comment. When you sign a baseline, the electronic signature is attached to the baseline and is displayed in the baseline editor, on the Electronic Signatures tab. You can view information about the signature, such as when it was signed, the reason for signing, and any associated comments. You can now compare proposed changes with the version of an artifact in the source configuration. Previously, you could compare only with the version in the target configuration. While you work in a side-by-side comparison view of a modified artifact or while you resolve conflicts, click the down arrow beside the artifact name in the right pane, and select the artifact to compare with. You can now resolve conflicts in the side-by-side view of changed artifacts by using the same Deliver and Do not deliver controls that were previously available only in the single composite comparison view. For primary text, use the new controls to copy a change from the target version to the proposed merged version. A side-by-side comparison now opens as the default view for artifacts that have changed in both configurations. You can now navigate through the changes in a module by using the Next change and Previous change buttons in module compare and merge views. In earlier versions of Rational DOORS Next Generation, you could not keep track of which conflicts you resolved when you delivered change sets. Now, conflicts are listed on the left side of the Deliver Change Sets page. You can use buttons to choose how to merge the changes with the version in the target stream. You can deliver all the changes from the source version, keep all the changes in the target version, or automatically merge them. As you work, you see a comparison between the proposed version and the version in the target stream. When you click Mark as Resolved, the conflicting change is moved to the Resolved list on the left side of the page. When you perform the following operations, if you create cross-project or cross-component links for artifacts, both outgoing and incoming links are created. When you create incoming links, they are stored in the project or component of the source, or outgoing, artifact, regardless of where you create the link. When you perform the following operations, if you create cross-project or cross-component links for artifacts, only outgoing links are created. 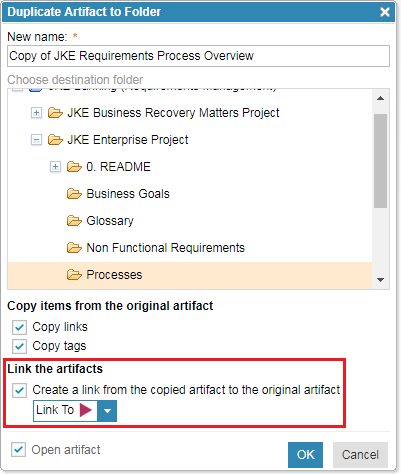 If you are editing existing cross-project or cross-component links and you change the direction of the link type from outgoing to incoming, or from incoming to outgoing, the storage location for the link changes. This is because cross-project and cross-component links are stored in the project or component of the source, or outgoing, artifact. When you change the direction of a link, it is deleted from the project or component where it is currently stored and created in the project or component of the source, or outgoing, artifact. The concept of link direction has been introduced for link types. Each link type now has an Outgoing role and an Incoming role. The Outgoing role represents the source of the link, and cross-project or cross-component links are stored in the project or component of the source artifact. Note: For existing link types, the object-to-subject role (previously called the "A to B" role) is the Incoming link role, and the subject-to-object role (previously named "B to A" role) is the Outgoing link role. 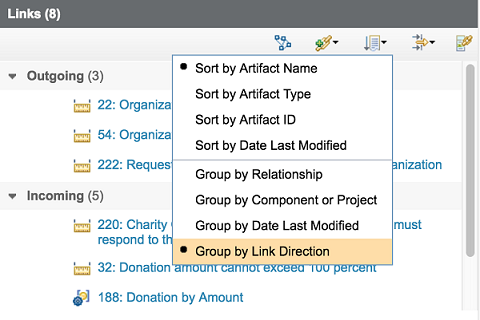 When link types are displayed in the user interface, icons indicate the direction of the link type role. 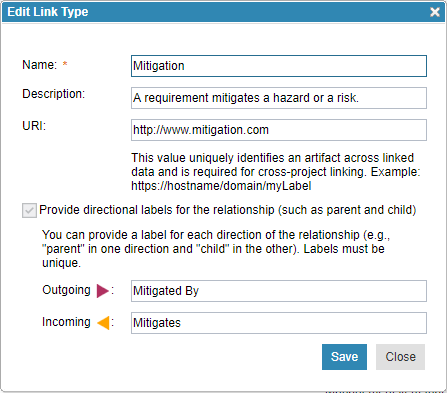 When you create cross-project or cross-component links, rules apply to link direction that are used to filter the available creation link types. When you create a cross-component link to an artifact in a baseline component, the new link cannot be stored in the baseline component. When you create a link to the web, the new link is stored in Rational DOORS Next Generation. When you create a cross-component or cross-project link using a link type that is only defined in one of the projects or components involved in the link, the new link must be stored in the project or component that defines the link. With these rules, you might need to adjust your current link constraints. Links are always stored on the outgoing side of the link. 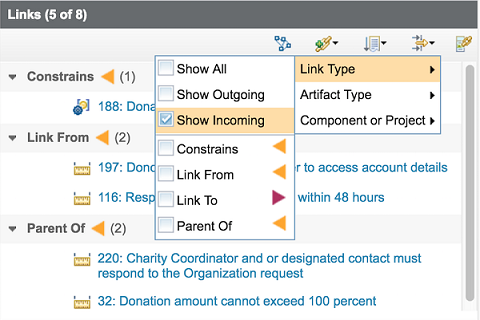 When you create or edit cross-component links, depending on where the link is stored, change-set-related messages might be displayed, and the available link types might be filtered to show only the outgoing link types. 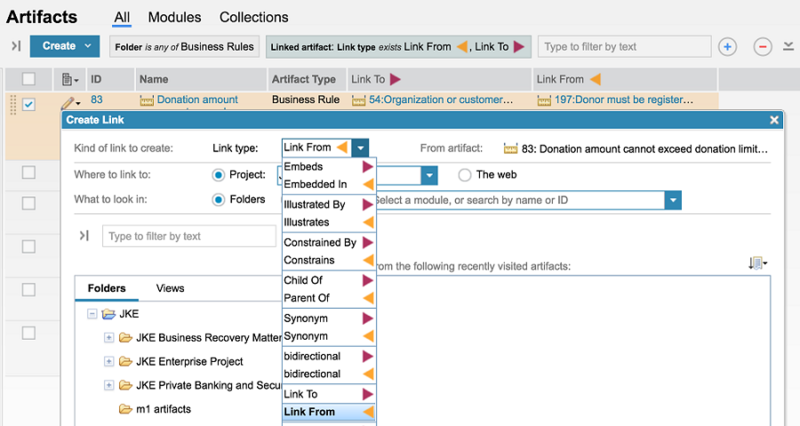 If the other component involved in the link requires that all changes occur in changes sets, but a change set does not exist, the list of available link types is filtered to show only outgoing link types. If the other component involved in the link is currently using a change set, a warning message is displayed that explains that you must deliver the other component's change set after the link is created. If the link type specified is incoming, and you switch the component to one for which a change set is required but does not exist, an error is displayed and the list of available link types is filtered to show only the outgoing link types. If the link is incoming from an artifact in a component for which change sets are required, and no change sets yet exist, an error message is displayed that explains why you cannot edit that link. If the link is outgoing to an artifact in a component from which change sets are required, and no change sets yet exist, the list of available link types is filtered to show only outgoing links. A warning message is displayed that explains why you cannot specify an incoming link type. If you change an outgoing link to an incoming link, and the link originates in a component that is in a change set, a warning message is displayed that explains that you must deliver the change set to see the changes to the link. If you edit an incoming link, and the link originates in a component that is in a change set, a warning message is displayed that explains that you must deliver that change set to see the changes to the link. Link swapper tool: Changes the direction of an existing custom link type into a new link type that you specify. Link storage tool: Ensures that cross-component links are stored in the component with the outgoing endpoint of the link. The Include links, tags and comments from base artifacts toggle button was removed. 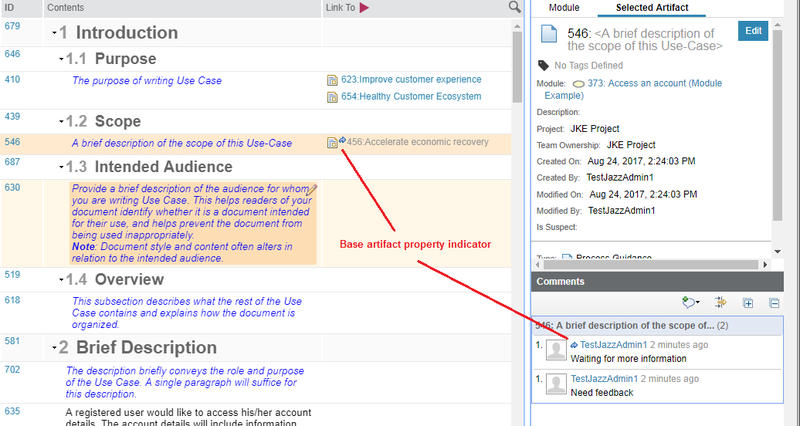 Now, modules always show the links, tags, and comments for base artifacts. Base artifact properties are indicated with a blue arrow. Base artifact properties are also displayed when you view an artifact in a module. You can now navigate to the base artifact for an artifact in a module by using the new options on the Edit menu. These options are also available on the More Actions menu when you view an artifact in a module. Process sharing is now supported in Rational DOORS Next Generation. You can now share user role definitions, workflow definitions, and permissions between projects. In the project that will share its permissions, user roles, and workflows, on the Administration menu, click Manage This Project Area. 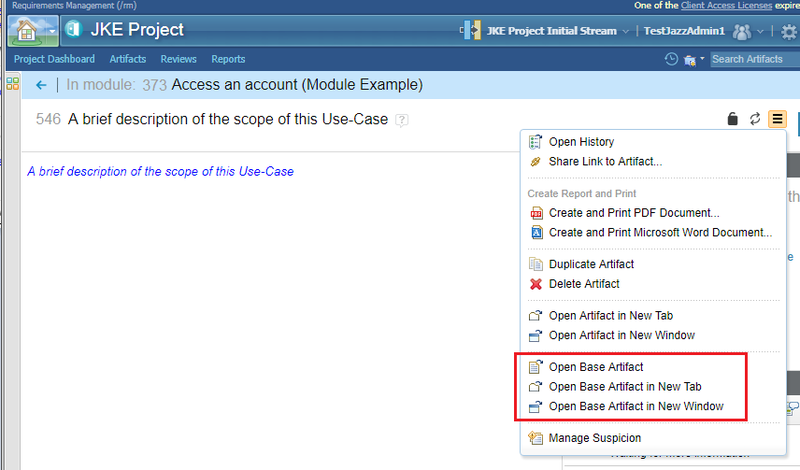 On the Overview page, under Process Sharing, select Allow other project areas to use the process configuration from this project area. With this option enabled, you can create new projects or update existing ones to use the process configuration of the project that you modified. If you update existing projects, you must go to the Workflows and the Roles pages and clear any overrides that are defined. Also, for permissions specific to individual types, such as Modify Actor Artifact, to function properly, you must import types into projects that are using the process configuration from another project area. To import project properties, on the Administration menu, click Import Project Properties. You can no longer create project areas by using the Administration menu from the All Projects Page or from within an existing project area. To create project areas, you must use the Application Administration user interface. 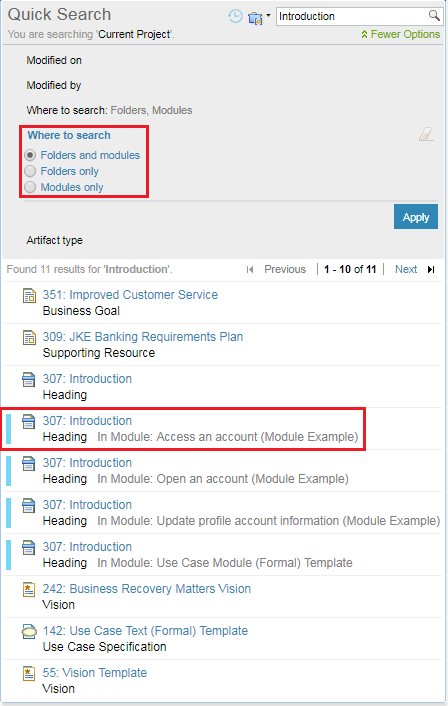 You can now apply project templates by using the Administration menu in existing project areas. The module and structure resources are available in either RDF or in a simplified JSON format. For the draft specification, see Rational DOORS Next Generation Module Resources. Automatic and on-demand TRS refresh operations are now supported in Rational DOORS Next Generation.The automatic refresh takes place each time a versioned resource that comes from an archived component is accessed. On the Administration menu, click Manage Application. In the navigation pane, under Configuration, click Advanced Properties. In the RM Core Component section, locate the GETs delete TRS 2.0 resources from archived components property and change the setting. By default, this property is enabled. If enabled, the automatic refresh removes the affected resource from the TRS feed. In Lifecycle Query Engine (LQE), the automatic refresh results in the automatic repair and resolution of skipped resources that originated from archived Rational DOORS Next Generation components. Administrators can refresh various areas of Rational DOORS Next Generation in the TRS feed on demand. The controls are available in RM Administration, on the Debug page, at the end of the Tracked Resource Set section. These controls are for administrative maintenance only, and can be used to repair data gaps or incorrect resources that are found on the LQE server. Rational DOORS Next Generation has a new Reportable REST API that enables users who create or modify templates with Rational Publishing Engine to report on electronic signature information. The new API only displays electronic signatures if the report is run against artifacts in a baseline that has been signed. For details about the API, see Rational DOORS Next Generation Reportable REST API. In previous releases, unexpected results occurred when ReqIF packages were imported into multiple configuration streams. Creating links and views is not supported with parallel configurations. Links and views are actively skipped when they are imported into a parallel stream, and are reported in the import report. Until importing links and views is supported, exclude links and view definitions from packages that are intended for parallel import. Excluding them from the package makes it clear that they will not be shared. For more information about links and views, see Workarounds and Limitations: Known issues in Rational DOORS Next Generation 6.0.5. Some ReqIF packages contain system properties, such as Created On. In situations where these values are not useful, they are ignored and not displayed in the comparison wizard. This behavior applies to packages from Rational DOORS and Rational DOORS Next Generation, as well as other tools that follow the ProSTEP ReqIF Implementation Guide. When you import a new artifact, the ForeignModifiedOn and ForeignModifiedBy attribute values are set. A new server API is available that enables advanced users to copy types between projects and components from scripts or integrations. For details about the API, see see Rational DOORS Next Generation Type Import Resources 1.0. 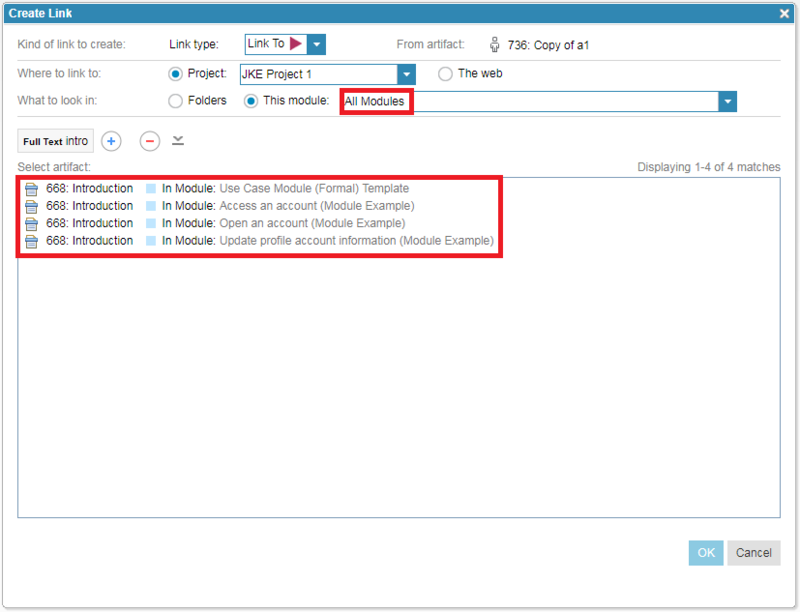 When you open an artifact in the context of a module, a light blue banner at the top of the page indicates that the view is associated with an artifact in a module, rather than a core artifact. The name and ID of the module is displayed in the blue banner. In 6.0.4, the bulk editing feature was added for views, which enables you to update multiple attributes across all artifacts in a view. In 6.0.5, you can now also edit the artifact type, owning folder, and owning team area. When you scroll through a module, more pages are now cached in the browser. This caching helps increase performance when you scroll back to areas of the module that you recently viewed. Pages are also preloaded above and below the current scroll position so that content is displayed faster as you scroll. Number of artifacts in a module page: The number of artifacts that are requested from the server per page in a module. The default value is 30 artifacts. Number of pages to cache per module: The total number of pages to cache when scrolling through a module. The minimum value is 3 pages and the default value is 10 pages. Increasing the number of cached pages increases the amount of memory that the client's browser uses. Number of pages to prefetch in a module: The number of pages to prefetch in either direction from the current scroll position. This value is limited to between 1 and 3 pages. The maximum is 2 pages if over 50 rows are loaded per page, and 1 page if over 100 artifacts are loaded per page. Note: Increasing these properties to very large numbers can adversely affect load time. If modifications are required, increase the values slowly to determine the best results. When you use the Quick Search feature and click More Options to include the Modified on, Modified by, Where to search, or Artifact type settings in your search, the setting you last used now persists across browser sessions. For example, if you click More Options for a project or component and specify Modified by: Current User, the next time you start your browser and click More Options, the Modified by: Current User filter is already defined. By default, the Quick Search results now include artifacts in modules, along with the usual core artifacts. A new option also enables you to show only core artifacts or artifacts in modules. In the search results, a vertical blue bar indicates that the artifact is in a module, and the module name is displayed in the result description. When you select artifacts, the selection dialog box has a new All Modules option in the What to look in field. When you select This module > All Modules, the scope becomes all modules in the component or project. When you select this setting, the results show the same visual indicators and owning module information for artifacts in modules that the Quick Search feature shows. When you duplicate an artifact, or perform a function, you can now choose to create a link from the copied artifact to the original artifact. Each link type has a defined direction, but when you create a link back to the original artifact, the direction of the link is the reverse of the typical direction for that link type.